Have you ever wondered how to calculate the revenue stamps (excise tax) on the sale of real estate in North Carolina? The tax rate is $2 per $1,000 of the sales price. So if you purchase a home or land for $900,000, the revenue tax would be $900,000 divided by 1,000 and multiplied by 2, which equals $1,800. I hope this clarifies howto calculate the revenue stamps on the sale of property in North Carolina. Incidentally, this tax has not been raised since 1991. This past weekend felt like spring was in the air with temperatures in the low 70's. It was perfect weather to be out on the golf course, hiking or working in the yard. Then, a day later, we had some flurries. Just when it looks like spring has really arrived, one more quick snowfall always seems to sneak in and surprise us. By mid week, we should be back in the 60's during the day and it should be a great Easter weekend to spend in the greater Cashiers and Highlands area. Do you believe in love at first sight? If youve ever seen the sun setting over beautiful Lake Glenville and the majestic mountains just beyond were sure you do! However, were talking about a love that will last for future generations. In terms of investment property, Lake Glenville homes have a proven track record making this area a popular spot for legacy properties homes that are passed down, from generation to generation. We invite you to view the sales list below for lakefront homes in Glenville sold throughout 2008 and the first quarter of 2009. Now may just be the perfect time to buy or build your dream home, and we think Lake Glenville may just be the perfect place. To begin the quest for your ideal mountain lake home, we invite you to call Silver Creek Real Estate Groups brokers Jochen Lucke or Elaine Zachary at 828-743-1999, or e-mail them at either jlucke@ncliving.com or elaine@ncliving.com. They look forward to meeting you and helping you find a home you and your family will love for years to come. 2 bedroom/3 bath home in South Tater Knob sold for $729,000. 3 bedroom/3 bath home in Tater Knob sold for $735,000. 3 bedroom/3 bath home in Tahala Shores sold for $850,000. 2 bedroom/3 bath home in Woudes Mountain Village sold for $1,050,000. 3 bedroom/2 bath home in Lakewood Shores sold for $975,000. 3 bedroom/4 bath home in Lakewood Shores sold for $1,150,000. 3 bedroom/3.5 bath home in Buck Knob Landing sold for $1,200,000. 4 bedroom/4.5 bath home in Summer Cove sold for $1,550,000. 4 bedroom/3.5 bath home on Buck Knob Island sold for $1,775,000. 4 bedroom/4.5 bath home in Summer Cove sold for $1,600,000. One need only stand on the banks of her peaceful tree-lined shores and admire the sunlight glimmering on her tranquil waters to appreciate the beauty of Lake Glenville. The view from the water is just as spectacular. Magnificent luxury lakefront and lake view homes peek out from between the tall pines and ancient hardwoods that line her banks. The owners of those homes hold front row tickets to what is arguably the best show in town sunset over the lake with a backdrop of pastel skies and mountains in the distance. That could be you standing on the private deck of your new home, overlooking one of the most beautiful views in all of the Southeastern United States. What are you waiting for? 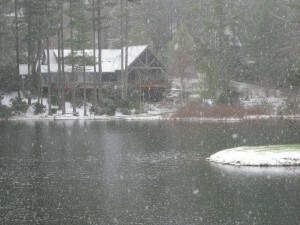 This may be the perfect time to purchase or build your dream home on Lake Glenville. There are many wonderful communities peppered along Lake Glenville such as Glenshore, Summer Cove, Summer Hill, Strawberry Hill, and Trillium just to name just a few. To view a list of homes currently for sale on Lake Glenville, please visit this link on our Silver Creek website - Homes For Sale on Lake Glenville. Once youre ready to find the home or homesite of your dreams, we invite you to contact Silver Creek Real Estate Groups talented brokers to set up an appointment for a private tour of any these fine homes or lots. To get started, simply call Jochen Lucke or Elaine Zachary at 828-743-1999, or e-mail them at either jlucke@ncliving.com or elaine@ncliving.com. They look forward to meeting you and helping you find that perfect view.